Russell Westbrook moved into sole possession of third place on the NBA's all-time triple-doubles list on Wednesday night in Brooklyn. Westbrook finished with 21 points, 15 rebounds and 17 assists as OKC rallied from 23 points down to earn a 114-112 win over the Nets. It was Westbrook's 108th career triple-double, breaking a tie with former New Jersey Nets guard Jason Kidd for the third-most in league history. Westbrook now trails only Magic Johnson (138) on Oscar Robertson (181) in career triple-doubles. This was Westbrook's fourth triple-double of the season - all coming over his past seven games. It was also the fifth time in his career that Westbrook has posted a 15-15-15 triple-double, recording at least 15 in all three categories. There have been only eight other such games since the 1983-84 season, with Kidd and Magic being the only players to do it more than once. Westbrook regularly surpasses the minimum mark of 10 in all categories when earning his triple-doubles. In fact, he's finished with exactly 10 just 24 times in rebounds (22.2% of the time), 22 times in assists (20.4%) and just once in points (0.9%). On the flip side, Westbrook has 24 triple-doubles with at least 35 points (including 11 40-point games and three 50-point games); he has 22 triple-doubles with at least 15 assists (including a career-best 22); as well as 22 triple-doubles with at least 15 rebounds (his triple-double high of 19 is one shy of his career-best mark on the boards). In addition to topping the minimum benchmarks by an average of 16.5 points, 2.4 rebounds and 2.7 assists, there is another mark of that statline that stands out: plus-8.7. The Thunder outscore their opponents by an average of 8.7 points with Westbrook on the court in games in which he posts a triple-double. Oklahoma City has gone 89-19 for a win percentage of .824 when Westbrook records a triple-double. Westbrook passed Kidd's triple-double mark in 628 fewer games played. Kidd reached double figures in triple-doubles only twice during his 18 NBA seasons with a maximum of 13 triple-doubles in the 2007-08 season, which was split between New Jersey and Dallas. Westbrook has reached double figure triple-doubles in four seasons already, including an NBA-record 42 during the 2016-17 season alone. During that MVP season, Westbrook topped Robertson's 55-year old record as he joined The Big O as the only players to average a triple-double for an entire season. For good measure, Westbrook did it again the following season to become the only player to do it twice. Westbrook's triple-double frequency has exploded over the past four-plus seasons. He had just eight triple-doubles in his six seasons in the NBA combined - in a total of 440 games played for a triple-double frequency of 1.82%. Since then, Westbrook has posted a triple-double in nearly one-third of his games. Since the beginning of the 2014-15 season, Westbrook has 100 triple-doubles in 323 games played for a frequency of 31.0%. For his career, Westbrook's triple-double frequency stands at 14.2%, which is close to the legends he is still chasing. Magic Johnson had 138 triple-doubles in 906 career games (15.2%), while Robertson had 181 in his 1,040 games (17.4%). Westbrook has climbed the all-time triple-double ranks quickly, but will need to put in some time to reach those final two steps on the ladder as he trails Magic by 30 and Oscar by 78 triple-doubles. 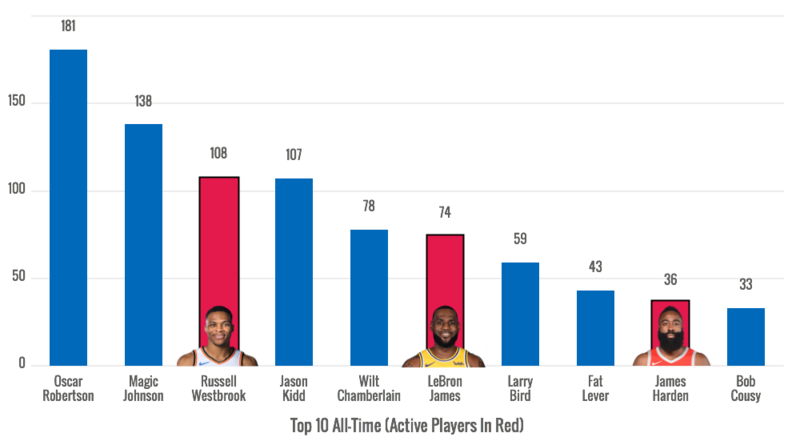 With the torrid pace he's maintained over the past few seasons, Westbrook has a great shot at becoming the NBA's all-time leader in triple-doubles as he cements his legacy of as one of the NBA's top do-it-all players ever.